Monogrammed Cutting Board Just $11.99! Down From $30! Shipped! 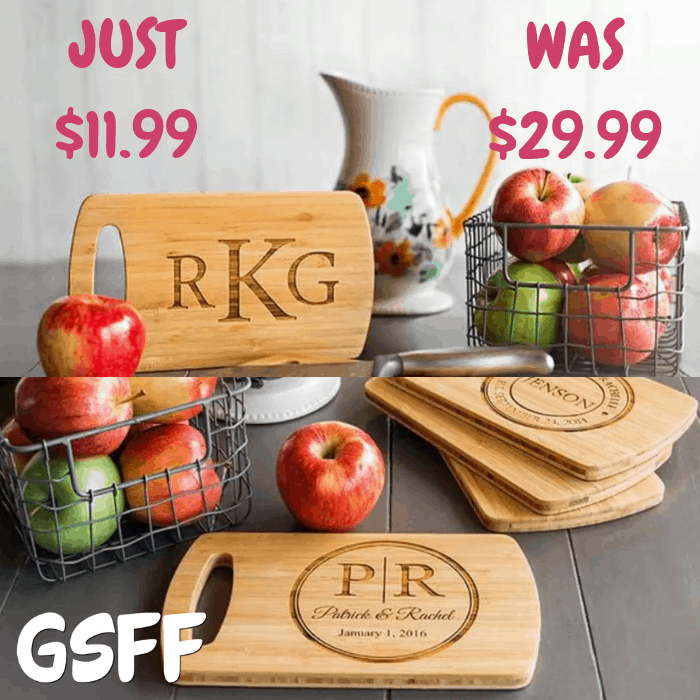 You are here: Home / Great Deals / Monogrammed Cutting Board Just $11.99! Down From $30! Shipped! Hurry over to Jane where you can this Monogrammed Cutting Board for just $11.99 down from $29.99 PLUS FREE shipping! This Personalized 5 ½ x 9 ½” Easy Carry Cutting Boards are not only charming and lovely to look at, they are also very functional. This is the cutting board you will find yourself reaching for time and time again! With the convenient side handle, they are even easier to use. When not being put to work, they add the perfect touch of personalized décor to any kitchen and also serve beautifully as a serving board. Made from solid bamboo and laser engraved with your choice of 11 exclusive designs, these boards make the perfect gift for bridal showers, weddings, anniversaries, housewarmings, and for anyone on your list. While you are ordering, make sure to get one (or two) for yourself as well; you’ll be very glad you did! Bamboo is one of the most durable and best types of wood for cutting boards. One side of the cutting board is personalized for display and the other side is used for food preparation.